I’ve been in the Philippines now for a few short days. I have been hot and uncomfortable, I have become stiff and sore and I am very very happy about it. I didn’t know it, more than a year ago, when I was looking into attending Russia House in the Philippines, that I would find exactly what I was looking for. I had been pursuing Silat with great focus for the previous six years and was feeling that I needed to get back to aspects of my training that had been put on the back burner. My main goal at that time, was to return to my sword training, to connect to my FMA roots, in the country where the art originated. Russia House was an obvious choice for many reasons. Firstly, two instructors I was already training with would be there, allowing me to continue my development in SSBD with Maul Mornie and in SBL with Alvin Guinanao. Secondly I had met the host Alex Pisarkin and I knew that he had developed relations with many grandmasters of FMA through his years of training and travel in the area. It was important to me to be properly introduced, to the FMA community in the Philippines. After all, my only understanding of the country and the culture had been through the study of the history, and the stories that were shared through the North American FMA community. I didn’t want to get it wrong and end up accidentally challenging someone I wanted to learn from. When I spoke to Maul Mornie about the benefit of training at Russia House, he had several reasons beyond teaching, that motivated him to attend the event. It seemed to me that chief among these was to meet GM Macapagal, whom he insisted was a famous swordsman and scholar in the Philippine martial arts world. Obviously Maul was aware of the other grand masters we would meet through the camp and gave them due mention, but, it struck me that this swordsman in particular would be somehow significant. Maul has introduced me to a few excellent teachers already, so I was very curious about this one. As always, I did my best to remain reserved about my expectations, and waited to see what would happen. I made my arrangements and when the time came, jumped on a flight to the camp that would shift my training significantly in the year that followed. As it turned out, GM Romeo Macapagal was the first of the FMA instructors to make a presentation. He had five students with him, whom I later found comprised his entire group, here in the Philippines. He had them prepare a space for his lecture and presentation. Lines were drawn on the ground for the purposes of delivering an overview of what i would come to know as, the Kalis Ilustrisimo concept of ‘measure’. I recorded this presentation and studied it when i got home. I practiced what I could glean from it through the year and even used the understandings in sparring and at a Dog Brothers gathering. There was no doubt in my mind that this material had changed the game as I knew it. I immediately made arrangements to host Fabrizio Mansur Filograna, a scholar of the system who was putting together a North American tour to teach Kalis Ilustrisimo, as it was taught to him by GM Macapagal. When that seminar was over, I understood that I had previously only digested one of the methods used in the art, to achieve measure. I knew that I had to get back to the Philippines to learn more. Arrangements were made, and after a visit to Brunei and Maul Mornie for his international silat camp, I jumped once again on a plane this time to train at the masters home. I only discovered when I arrived here in the Philippines, that Fabrizio had requested that GM Macapagal accept me as a student. I have been here a week, now and have trained five to eight hours per day with Macapagal and his small group of students. It has been, and continues to be one of the most incredible training experiences of my life. I have had some incredible training experiences, and having this takes nothing away from them. It is simply that this experience is unique in many ways. For one, this teacher rarely accepts new students. It seems to me that he doesn’t accept students so much as select them intentionally, only after a period of study and investigation of their goals and their process. Secondly, these days have been put aside, by the GM and his students, specifically to train me, in the basics of Kalis Ilustrisimo. The art is taught exactly as it was taught to each of them in turn, since a young Romeo Macapagal made the commitment to preserve the art that was taught to him by Tatang Ilustrisimo, without change or embellishment. To this end, the students show up each day individually and in groups as their schedules allow, to assist their teacher in this work. This training is something akin to training for a Formula One race, where each lap has clear training goals and every pit stop is attended to by a pit crew as professional at their jobs as the head coach is at setting the goals and assessing the trials. In each area of the training, GM Macapagal clarifies the theory, illustrates the history, shares anecdotes from Tatang’s life experience and demonstrations of what is physically expected of me. When I stand, the students move in, handing me the appropriate equipment for the task at hand. Be it the mask, gloves, stick, trainer or blunt they prepare me and set me before my trainer. When the physical lesson begins the feeding is consistent and paced for me to succeed. Pauses occur when necessary to refine my understanding and correct my application of each skill presented. With each success, pressure is increased until a perfect example of the skill in question is achieved. The equipment is removed and I am made to rest, reflect and ask questions. The process is deliberate, successes followed by rest, to allow the feeling of the movement to set, to allow the pondering of the application to develop. Each day, the previous information is reviewed and tested in theory and in practical application, before new information is introduced. It can be mentally exhausting, but always there is sensitivity and care. Hydration, laughter and camaraderie seem to clear away the fatigue and make room for more work. Day after day the testing becomes more intense and I find that I am beginning to see the language of the art and the principals coming together along with the movements. Very quickly I have begun to see the basics, I have no doubt that through this method, I will retain what I have learned, and be able to explore these principals when I am without the direct guidance of my seniors and GM Macapagal. It all sounds so formal when I read the above, but in truth, it feels like family. Because it is. Romeo Macapagal is not one to take students as a business. None of what he does is marketed or meant to call students to his banner. He has other business to attend to, a long list of professional titles he has tended to over the years, a wealth of education, formal and self taught. But his sharing of this martial art is all about his love of it and his commitment to preserve Tatang Ilustrisimo’s work. This is one of the other aspects that make this experience unique in my own life in martial arts. While the majority of the martial artists I have worked with in my time have been in the process of discovering themselves and their own personal development through martial arts, while it is common in the JKD community to seek to somehow leave a personal achievement or a development we can attach our own name to… The belief here is that this art should be taken for what it is, the lasting lessons of a legendary swordsman. This is a thought that has been transmitted to me. In what way am I able to develop or evolve the teachings of a master swordsman. How can I, a person living in relatively peaceful and non sword bearing time, think to add to, or improve on a complete, blade oriented system. How does that sound to you? For me, it is grounding. Here I have the student of a man who lived in a time where the sword was always present, where the consequence of combat was so commonplace, that one did not think the trauma of the event, as witness or combatant was unusual. I have fought, I have even been up to the line of lethal choice and have been fortunate enough, not to know myself on the other side of that line. I find that I have no need to make changes to what I trust is the correct way to approach a lethal confrontation with a blade. For me this is very grounding and it is new. Up until this time, I have had many questions about what would be clarified for me if I ever was forced to cross that line. Somehow that line of thinking is now quiet, the dialogue seems to have been completed. I have had fun on this trip sparring with folk from this system and from other training groups friendly to the students I have been training with. I find myself using the lessons in sparring already. If you have trained and fought, you will know that there is usually a period of integration. It usually takes me years to integrate techniques into my fighting. That is not the case with what I am learning now. In many ways this is because, the training does not require me to unlearn what I have already acquired. The lessons are principal based, so they integrate with everything I already know and add to areas where I had deficiencies. It is amazing to me the areas where i had training, training that worked, training that was the best available at the time, that suddenly I have parameters for analysis. Now, games that I developed through study, trial and error, that I developed based on formal education and direction from great teachers, have clearer dimension and timing. I am seeing differently, I am analyzing in real time. It isn’t like something magical has happened through this experience. It is really quite the opposite. Something clear and simple is being introduced to me. I can see that I will be exploring and unraveling this work for some time. I see that I will be coming back, that I will be working with all of my seniors in the system, going forward to hone my skills and clarify those areas I still haven’t grasped. I can see that I will be keeping in touch and that I will be concerned for the well being of all of these people that welcomed me into their tribe. I am grateful for the introductions made by Maul Mornie and then Alex Pisarkin, that led me to the lecture, where I saw a first inkling of what I needed, to change my game. I am grateful for the faith Fabrizio Mansur Filograna had in me when he asked that I be given this chance. 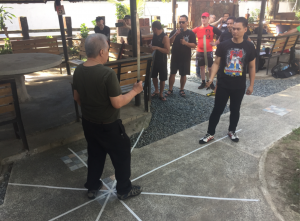 And I am very grateful to GM Romeo Macapagal and his group of students for teaching me the basics of Kalis Ilustrisimo and for their commitment to preserving the art as it was taught by Tatang Ilustrisimo.